I had one more logging tool related to genstats and logintop10 that I wanted to point out, and unfortunately I can’t do much more than this when I show it. That’s a disappointment on two counts, first being my relative dunderheaded attempts at feeding andatool a proper regex string. I’m dunderheaded about regex on the whole, so I suppose it’s not to be expected. 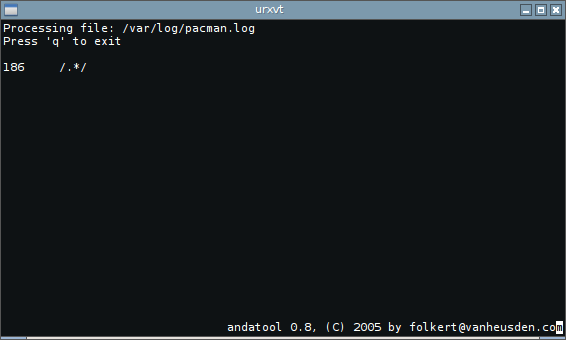 The other disappointment is in the fact that andatool is continually skimming through my /var/log/pacman.log file, forever and ever, looking for matching strings. As the log gets updated, the counts update … or they would, if I could get it working and show an animated image. I can give you a few pointers though. You have to designate a file for andatool to skim through, with the -i flag, and you have to give it the full path. That might sound obvious, but I wrestled with that for a little bit. Also, it seems more intuitive to use the -s flag each time, since that tells andatool to start at the beginning of the file and work the whole way through. I can imagine where it might be useful to omit it, but all of my best attempts were more interesting when I included that flag. And I should mention that you’re not limited to one expression, so you could search through a log for several different instances, and watch each one update. 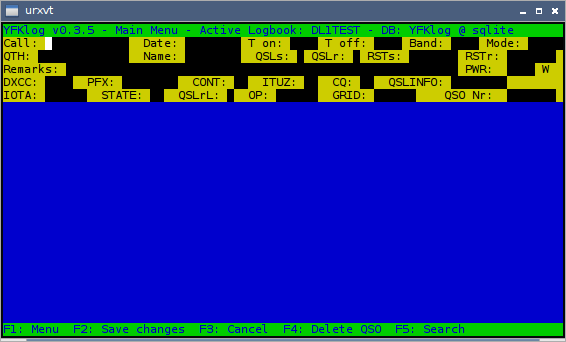 I don’t recall too many live log filter tools, so andatool seems worthy of mention. Not in AUR or Debian that I could find; don’t let that keep you from trying it though. This entry was posted in Linux and tagged filter, log, search, view on 2015/03/06 by K.Mandla. 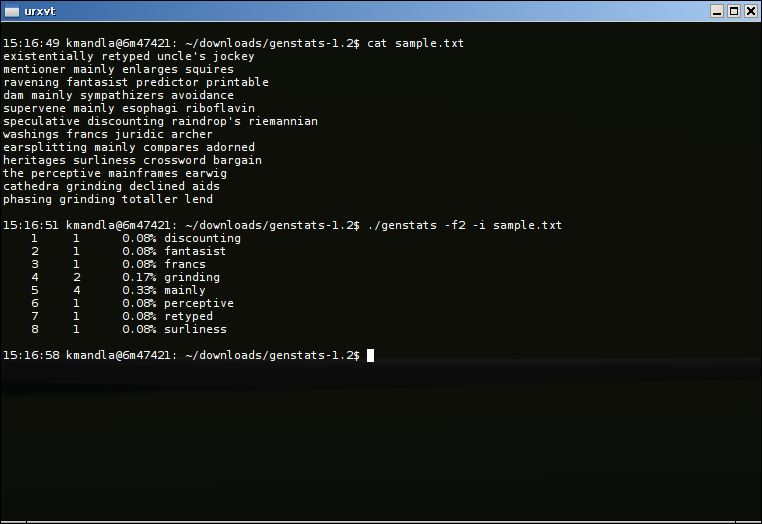 I can see the usefulness of genstats almost immediately. Given a text file, you can pull out a frequency report with very little effort. And since genstats handles its input and output in much the same way as cut, you should be able to get the information you want within just a few minutes of compiling it. It may not be appealing to you to track word frequency in a flat text file, but consider what you could do with genstats and your average log file. That is the author’s suggestion, and the screenshot on the home page gives a good example of some advanced genstats usage. My only complaint about genstats is so trivial that I’m embarrassed to mention it. In a file with 12 lines, and with four of the words in the second field being the same, the display should read “33%,” not “0.33%.” The latter is a third of a percent, while the former is a third of the whole. Or perhaps there is another calculation at work there, that I’m not sure about. I get the picture though. 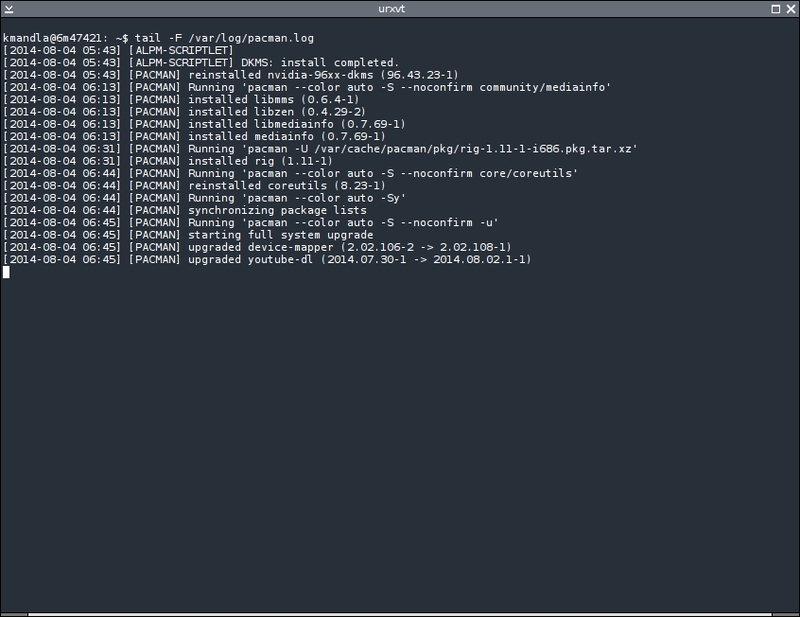 And having said that, I suppose it’s worth mentioning that gentstats doesn’t give you a lot of control over the output. As best I can tell, that is the only style of report you’ll see from genstats. This entry was posted in Linux and tagged file, information, log, report, statistics on 2015/02/21 by K.Mandla. Both head and tail are easy enough to figure out: By default, they show the first and last 10 lines of a file, respectively. Nothing fancy there. There are a few flags that are worth mentioning, and since both head and tail are owned by coreutils, some of those options are shared between the two. -cN: Shows N characters (technically bytes) instead of lines. This can be a godsend if you just want to pluck a certain number of characters out of /dev/urandom. -n: Sets the number of lines to show, so you’re not limited to just 10. You can use bytes here as well, and specify a specific data quantity with conventional suffixes for multipliers. 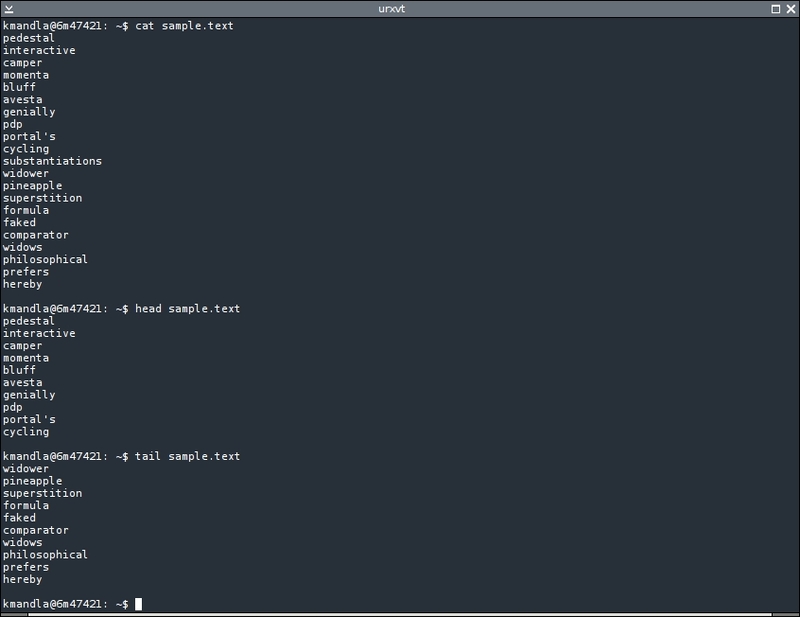 So for example, head --bytes=1b sample.txt would show the first 512 bytes of sample.txt. If you add a minus sign to the --bytes data quantity in head, or a plus sign to the --bytes data quantity in tail, both tools will omit the last or first block of that size. That might be a little confusing; think of head --bytes=-12 sample.txt as “show me all but the last 12 characters of sample.txt” and tail --bytes=+12 sample.txt as “show me all but the first 12 characters of sample.txt.” It might take a little getting used to, but it works, and can be handy. 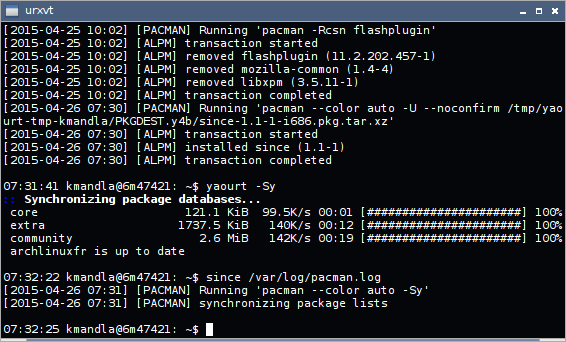 Perhaps you knew this and perhaps you didn’t, but tail has a built-in log display mode, as the --follow flag. As you can see there, with no more than just the -F option, you’ll get a by-the-second update of what appears in a log file, each line added to your display as it is added to the original file. No muss, no fuss. 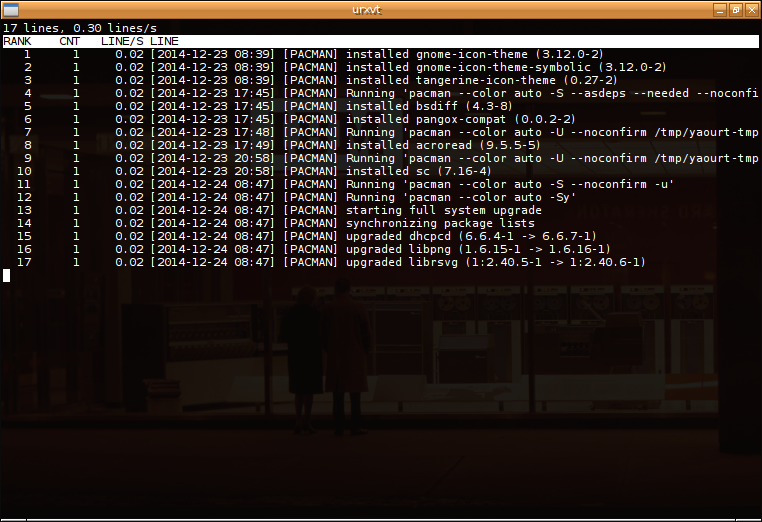 This entry was posted in Linux and tagged data, display, file, log, text on 2014/08/04 by K.Mandla. This randomized revisitation of the C section has been a veritable tapdance through colorization tools. If I had known I had so many, I would have devoted a whole week to them. I have one more that starts with C, and then I’ll return to the entire alphabet, as determined by shuf and ls. And since I’m on a roll with colorizing tools, I might as well finish up with colorex. A lot of the “shortcomings” I mentioned in clog are resolved in colorex. For example, it will, as you can see, colorize specific chunks or strings of letters, for as many times as they appear on a line. It can also bounce between colors even when they are exactly adjacent. 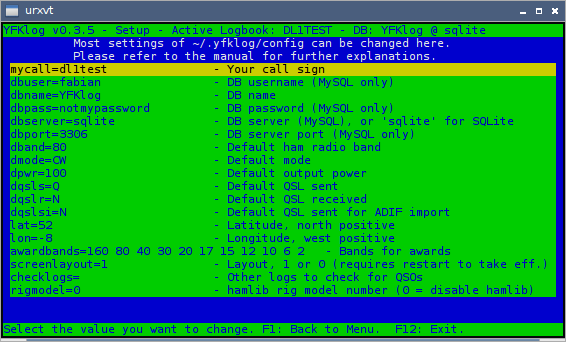 And most of colorex’s syntax is at the command line, so you can declare a color as you build the filter command. It also adds a blink code, underlining effects and bolding … only some of which is visible in a virtual console, but you get the idea. clog had a very straightforward configuration style, but colorex will require you to be a little more adept at the command line. Expect to escape some of your more complex searches and/or regexes to make sure colorex understands what you want. As an added touch, colorex has a randomization command, which will either surprise you with its results or drive you batty with the spattered color effects. I should mention that the random effects only seem to work on a full line. And out of fairness, I should mention that colorex doesn’t have the same degree of control over color — like red on purple text — that you can get quite easily with clog. Perhaps that will be in future versions. In spite of those shortcomings, I’m more inclined to adopt colorex than clog, just because it feels like there’s a stronger sense of control with the former than with the latter. It may not offer the same range of controls and it might be a little more challenging to configure, but it definitely picks up what clog stepped over. 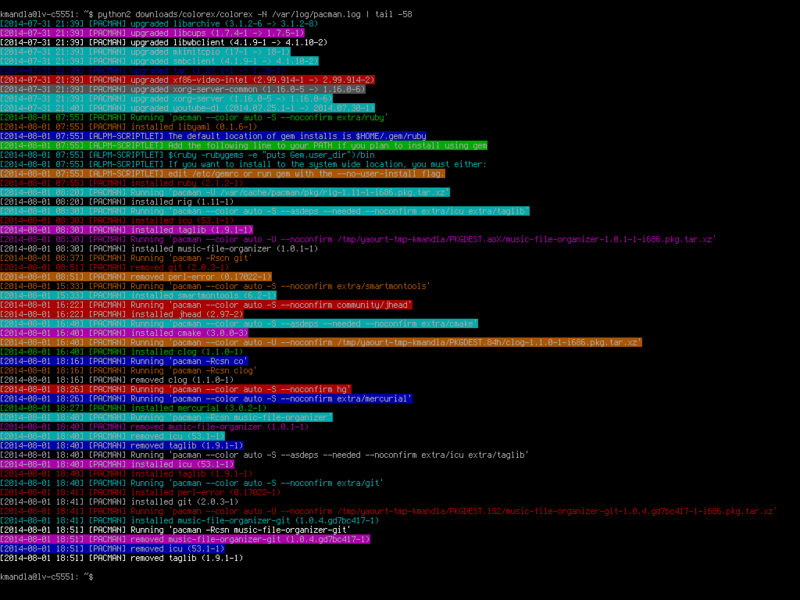 This entry was posted in Linux and tagged color, colorize, filter, log, text on 2014/08/03 by K.Mandla.